I was interested in “God versus the Idea of God,” by Thomas Richard Harry just by its title, as a fan of theology and philosophy. The book begins by presenting to readers the author’s relationship with God and his own struggle with faith. After opening up to readers by sharing his personal journey he takes them on a tour through the history of Christianity and the evolution of the Christian church. It is after this that the reader will be hooked into a philosophical, thought provoking analysis of the Church’s current role in the community, God’s existence or non-existence, and humanity’s morality and need for answers, “The Jesus Phenomenon,” and where faith and the idea of God stand. Harry’s voice flows as if having a conversation with the reader. It’s like speaking to a friend who is sharing his deep questions and thoughts on the God topic. Because of this, I felt safe to explore my own questions and opinions, and revisited my own struggles with belief, faith, and doubt, to re-affirm and even establish new ideas and feelings about my own spirituality and my relationship with God and the church, as well as theology, the need for the idea of God and humanity’s current needs for answers in general. I think that all of us, whether Christian, Muslim, Buddhist, Jewish, Hindu, etc., and even atheists, have gone through a quest for answers at some point in our lives. Some of us find some of those answers and some don’t. 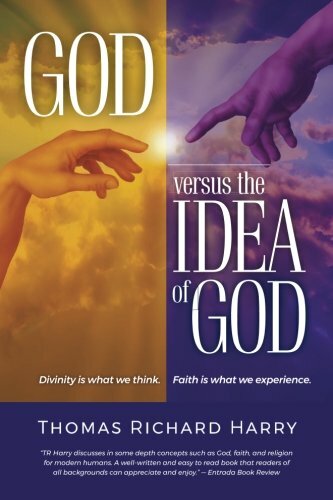 I found “God versus the Idea of God” by Thomas Richard Harry to be the perfect tool to guide readers into their own spiritual journey and quest for answers to their big questions, as the author showed an impartial view to a very personal topic, while discussing his own journey through this quest. I definitely recommend “God versus the Idea of God” to all philosophers, theologians, and any reader who wants to enrich their own spirituality or find their own idea of God.